After a failed experiment left me with a AOE Grimlock without arms I decided to salvage it. I grabbed a Construct Bots Breakdown and threw this guy together. Steelgrave was a powerful Decepticon The Autobots wanted him dead and that's how the Decepticons left him. With his arms blown off in battle and left to rot he used his powerful jaws to rip the arms off a barely functioning Autobot.With the help of a smaller Decepticon scout he'd protected in battle Steelgrave grafted his new arms onto his frame and rose again. Sick of the Decepticons treachery and the Autobots self riteousness he became a lone gun. Factionless he stalks the wastelands of Cybertron hunting for the highest bidder. ... oh god, it's truckzilla... it's perfect. This thing is completely ridiculous looking and the concept is absurd. Frankensteiny absurd... and I love every parts of it! Seriously, I love crazy mash-up like these. Check out my sig as proof. Also, that paint job is great! Any hint you wish to share? I sure could use it. -Kanrabat- wrote: This thing is completely ridiculous looking and the concept is absurd. Frankensteiny absurd... and I love every parts of it! Seriously, I love crazy mash-up like these. Check out my sig as proof. Thanks! I loved your Mother concept/figure...it was twisted and brilliant! Someday I hope to put together something that imaginative and twisted(a "father" perhaps?). Anyway as for tips: Lately I've really been trying to find spray paints the color I want so I get a more even coat and play with airbrush like effects. Aluminum foil is great for making masks to keep areas clean. I like Post-it notes thin width masking tape for smaller details. And I have affinity for metallic acrylics. Aluminum foil as paint masks?! Woah, I must try it out. Also, screw the haters and dont be afraid to make fokked-up frankenstein OCs. There's way too much G1, statues, and straight rapaints in the custom scene. One thing I love to do, is to take a look at my pile of junk, and see what parts would work well together. Often, I come up with bizzare and fun results. I expect lots of building and sculptimg will go into this one. -Kanrabat- wrote: Aluminum foil as paint masks?! Woah, I must try it out. Thanks again for the inspiration!! Aluminum foil has been good to me. I don't recommend heavy duty unless you're just wrapping though, it's a bit too stiff. While I enjoy the standards I really dig your aesthetics.You know...I think I'm going to make it my goal to go through my junkyard and come up with the most bizarre thing I can. So thanks and look out Mother! Morla?! That's going to be wicked! Can't wait to see how you tackle these two! Wish me luck, I gonna need it. 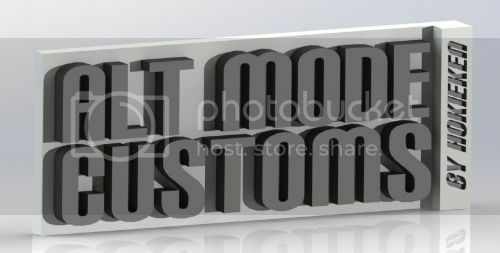 BTW, I'm looking forwad for your next project! Also, don't forget a vital rule: the thing must transform! No matter what it is. -Kanrabat- wrote: Wish me luck, I gonna need it. 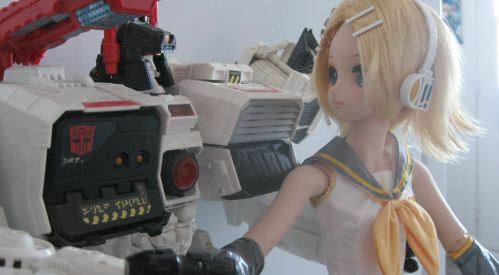 Of course///wouldn't be a Transformer if it didn't. I got ideas man. The 'bot mode looks pretty good and those arms fit nicely but the hands look way out of proportion (could just be camera angle). The alt mode is just ridiculous It's like the Joker turned into a handicap donkey! How in the hell did you make Grimlock look like he's giggling hysterically?! In all seriousness though, that paint work is great! I love the 2 metallics together and the wheels look super cool with the green rims and the spot of purple in the center. Why did you leave the gray alone though? IMHO the bland "plasticky" color really takes away from an exceptional repaint. I would REALLY love to see the legs in a metallic copper with some lighter colored shading on the spikes and some work done on the staff of the mace. Not criticizing though 'cause that's one great execution of a well-chosen color scheme. Thanks for sharing! hokieken wrote: The 'bot mode looks pretty good and those arms fit nicely but the hands look way out of proportion (could just be camera angle). The alt mode is just ridiculous It's like the Joker turned into a handicap donkey! How in the hell did you make Grimlock look like he's giggling hysterically?! LOL Thanks! Keep in mind I didn't plan or think it through.This was just a fever dream piece that was never meant to be anything other than a way to use a busted AOE Grimlock.Heck I wasn't even going to post it I didn't paint the gray plastic because I just didn't care. The more I worked on him the more I liked him.I came up with a little back story and then all of the dull plastic color and misshapen bits just kinda made sense so I left it go. Loving the paint-job on your projects. 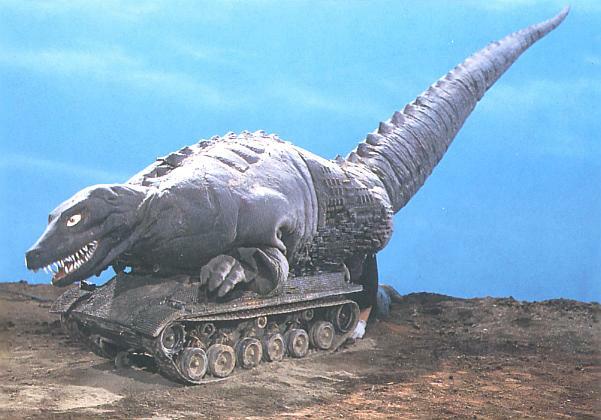 This thing reminds me of Dinosaur Tank from Ultraseven. One of the more bat-s*** crazy monsters to come from Japan. Still, ya' gotta love it. Okay I recognize the Ent, but what the heck is the tortoise from? That tortoise is Morla from the Never Ending Story. 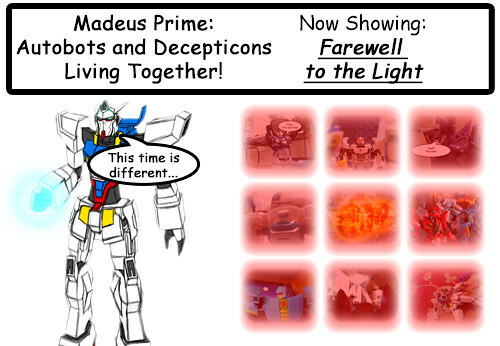 Thanks Madeus Prime!